When I lived in Dallas, I avoided the former gas stations or auto repair places converted into taco stands. With so many working gas stations housing taquerias it wasn’t necessary to review former gas stations. Here in Los Angeles it is a different story. There are few places with gas pumps where one can order a taco. 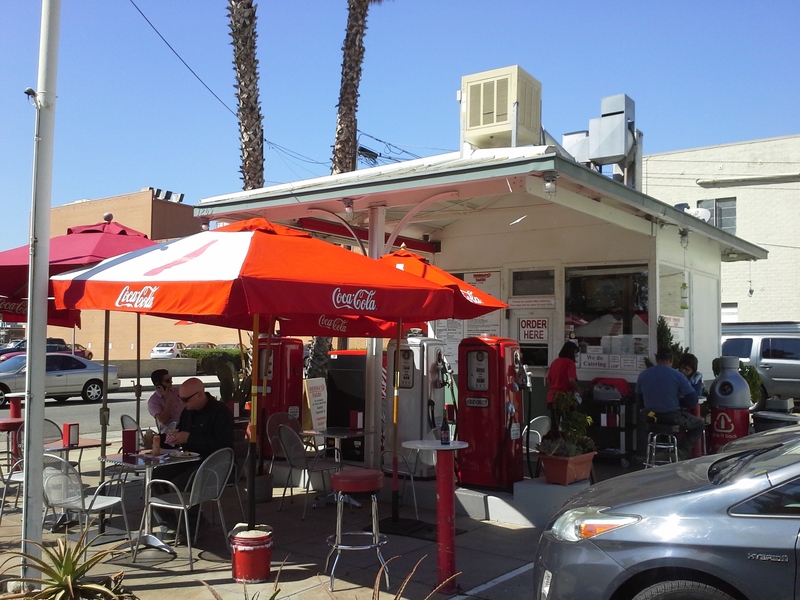 Fortunately, I came across a place in Pasadena with a few outdoor tables, chairs and antique gas pumps. The pumps no longer served fuel they now just stood there for aesthetic benefit. Perhaps someday when we are all driving cars that we plug-in at home and drive 5,000 miles on a single charge, gas stations will be obsolete and places like Norma’s Tacos will serve the needs of nostalgic gas station taco fans. If this is my future, I’m smiling. 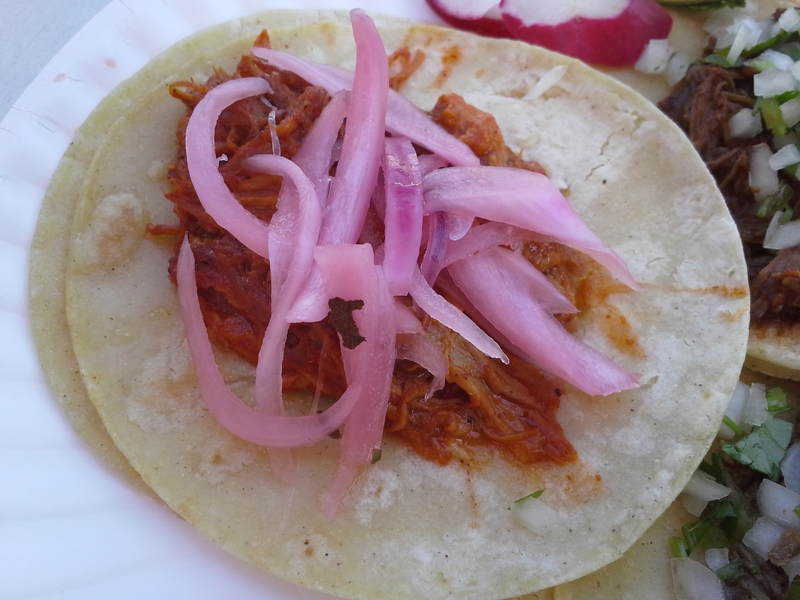 This was the first time I’ve seen a Cochinita pibil taco choice. I ordered one; though, I should’ve ordered several more. It comes with pickled red onions. I added beef and barbacoa tacos asking only for chopped onions and cilantro. Like many places they will serve the tacos with a guacamole sauce and shredded cheese. The pibil taco looked amazing when it arrived. One bite in and I was in heaven. Wow! This was simply one of the best tacos I’ve experienced. The meat was tender, flavorful and the pickled red onions made every bite extra special. I was about to be disappointed, as I usually am, when I tried the barbacoa taco next. It too did not disappoint. While not a traditional barbacoa made from slowly cooked cow’s head, Norma’s Tacos makes a slow cooked shredded beef barbacoa that is lean and spiced perfectly. However it was a bit messy as the red juices kept falling from the taco to the plate with a few drops landing on my shirt. Their beef taco was also lean and flavorful. All tacos were complimented with two homemade corn tortillas. 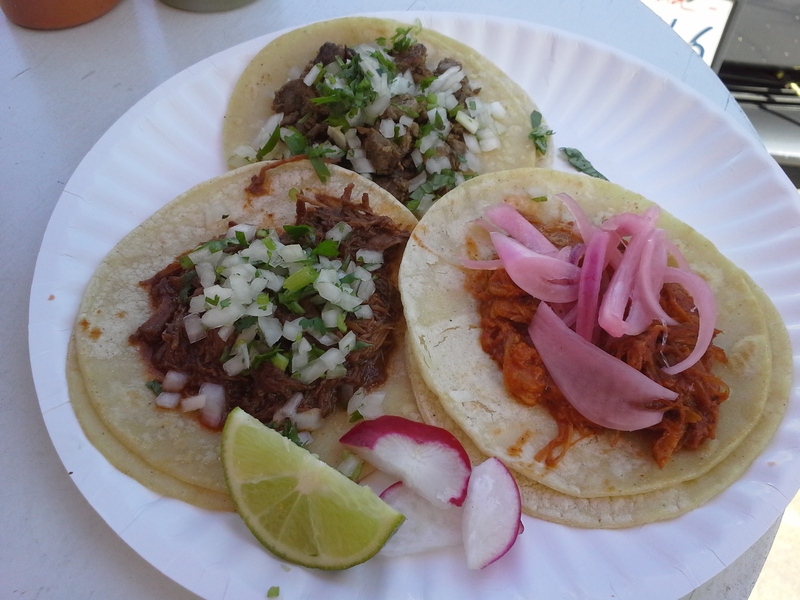 The beef and barbacoa tacos were served with a perfect amount of onions, cilantro and meat. They do not over stuff the tacos here, nor do they skimp. The only negative is a weak, watery green salsa. Good thing they have a great tasting red hot sauce that is also available. There is a cooler with several Jarritos plus some Mexican Coke though I went with the Sangria cola. Sadly this perfect oasis in Pasadena is closing down this weekend. They are relocating and reopening in two weeks to a rather drab looking strip mall looking storefront where they will blend in with dry cleaners, salons, and a Subway. It’s unclear what will happen to the antique gas pumps. Perhaps they’ll sit oddly in some corner of the new indoor location instead of outside glistening in the California sunshine. Those do look really good!! Sounds like California is treating you well! !